Enoch Lodge in Maybole, near Maidens, Ayrshire sleeps 8 people. Enoch Lodge near Maidens is one of the original gatehouses to Culzean Castle, and sits within extensive gardens with a large terrace with open barbecue room and private hot tub. Guests can follow the woodland walk to Culzean Castle estate and down to the beautiful sandy beach. Culzean Castle (owned by the National Trust for Scotland) is spectacular and is Ayrshire’s most popular tourist attraction. Situated on the Ayrshire Coastal Path, a 100-mile long coastal walk with one of the finest panoramic coastlines in the British Isles. Crowned with a superb backdrop of the ever-changing profile of the mountains of Arran across the Firth of Clyde, this coastline is steeped in history and brimming with wildlife, including red squirrels, deer, otters and seals, it is also a haven for bird watchers. The River Ayr Way sea walk is also easily accessed. Inland you’ll find many gardens and castles to visit and activities to do including riding, racing and golf. The many golf courses include the world famous Royal Troon and Turnberry courses, both close to hand, with Turnberry also having a fantastic spa and outdoor centre. The islands of Cumbrae, Arran and Bute are all easily reached for a day out while day trips to Ireland can be taken from Cairnryan. The pretty towns of Troon, Prestwick and Ayr are only a short drive with very good rail links for a trip to the cosmopolitan city of Glasgow and also historic Edinburgh. Loch Lomond and the Trossachs National Park is an hour’s drive and is well worth a visit. The beach is 1½ miles from Enoch Lodge near Maidens. With the shop and pub 1½ miles and the restaurant is 3 miles from Enoch Lodge. Living room: With wood burner, 65 Smart TV and wooden floor. Kitchen/dining room: With electric oven, gas hob, microwave, fridge/freezer, dishwasher, washer/dryer and French doors leading to terrace. Bedroom 2: With zip and link super king-size bed (can be twin beds on request) and en-suite with shower cubicle and toilet. Bedroom 3: With zip and link super king-size bed (can be twin beds on request) and en-suite with shower cubicle and toilet. Bedroom 4: With super king-size bed. LPG central heating, gas, electricity, bed linen, towels, Wi-Fi and logs for wood burner included. Travel cot and highchair available on request. Welcome pack. 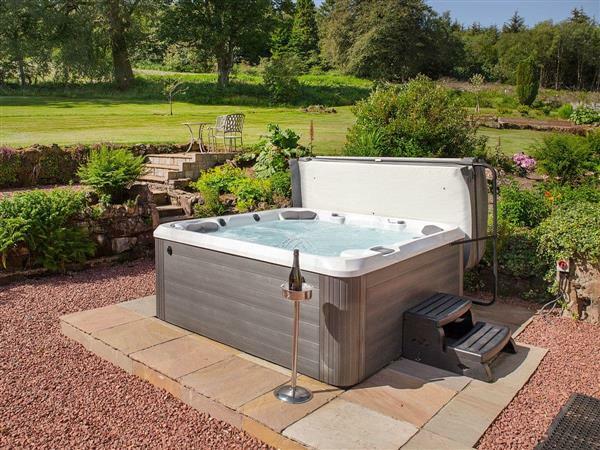 2-acre enclosed garden with terrace, garden furniture and barbecue. Hot tub for 6 (private). Bike store. Private parking for 6 cars. No smoking. Please note: There is an unfenced stream in the garden, 10 yards away. Holidays at Enoch Lodge run from Friday to Friday. Pets allowed at Enoch Lodge. For a better idea of where Enoch Lodge is, you can see Enoch Lodge on the map below. You can find more large holiday cottages (that's cottages which sleep 8 or more people) in Ayrshire. If you want to see more large cottages, have a look at large cottages in Ayrshire. Enoch Lodge is in Ayrshire; should you be on the lookout for a special offer, you can find all the special offers in Ayrshire. It's always worth checking to see what is on offer at the moment. Do you want to holiday near Enoch Lodge (UKC2930), you can see other cottages within 25 miles of Enoch Lodge; have a look to find your perfect holiday location.